On March 12, 2015, Sir Terence David John “Terry” Pratchett passed away after a years-long battle with Alzheimers. If I had to single out an author as my all-time favorite, it would be Terry Pratchett. It’s fitting that my first exposure to Pratchett’s work was through a video game. 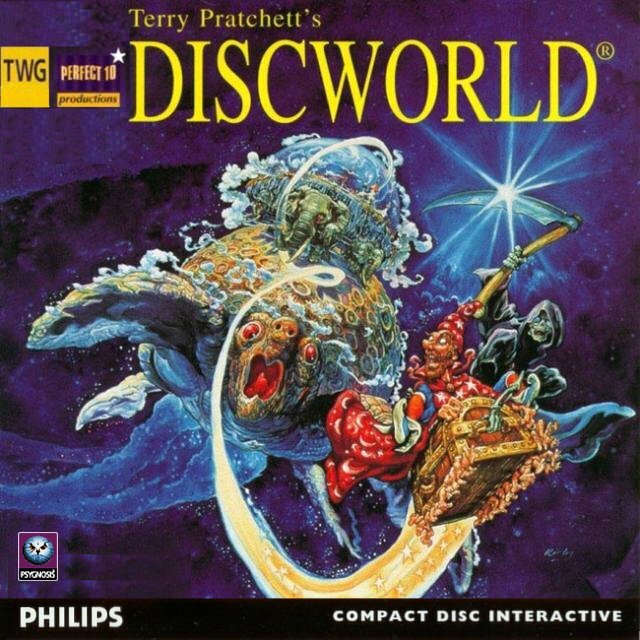 In 1995 the now-defunct publisher Psygnosis released a beautiful point and click adventure game called Discworld, based on Pratchett’s incredibly successful and already long-running series of fantasy novels. The game had some bright visuals, lovely animations, fantastic voice acting (Eric Idle as Rincewind!) and was completely hard as balls – like many adventure games of the era. Still, I absolutely fell in love with the uniquely satirical world full of that lovingly dry British wit that Pratchett exuded. It was probably a good year or two before I realized this quirky game was based on a successful series of novels – one quick glance at a bookshelf revealed whole shelves of Discworld novels just waiting to be devoured. And devour them I did. By the time I started reading there were about twenty Discworld novels. To my great shame I did not go through and read them all, but picked and chose based on the main characters. I read everything starring Rincewind the bumbling wizard, and eventually enjoyed the books starring Death, the City Watch and the random one-offs that eschewed various parts of our culture and society. To my fellow Discworld fans this means I read everything except the Witches novels, up until The Wee Free Men, making my total Discworld collection about 2/3 complete. Rincewind, Death, Lord Vetinari and Cohen the Barbarian drew me into Discworld but it was Samuel Vimes and the Ankh-Morpork City Watch that kept me enthralled. By the time I entered High School in the late 90s I was buying Discworld novels as they released fairly regularly, and the novels starring the hilarious City Watch had become my favorites. Since most of the novels took place in the London stand-in of Ankh-Morpork, many of the Watch’s characters showed up in novels even when they weren’t the stars, a brilliant concept that would continue throughout the series. I continued to keep up with the Discworld novels in my college years, as Pratchett’s world entered the Industrial Revolution. Many novels took on specific aspects of modern industry such as film, journalism, shipping and banking and eventually tied together with new protagonist Moist Von Lipwig. Thankfully my beloved City Watch continued to star in just about every other release, and Sam Vimes went through an especially satisfying and rewarding arc. Sadly it was at this time that Pratchett was diagnosed with a rare form of Alzeheimer’s. Ever the cheery optimist he continued to write and published several more novels over the following years. I regret to say I haven’t read them yet. 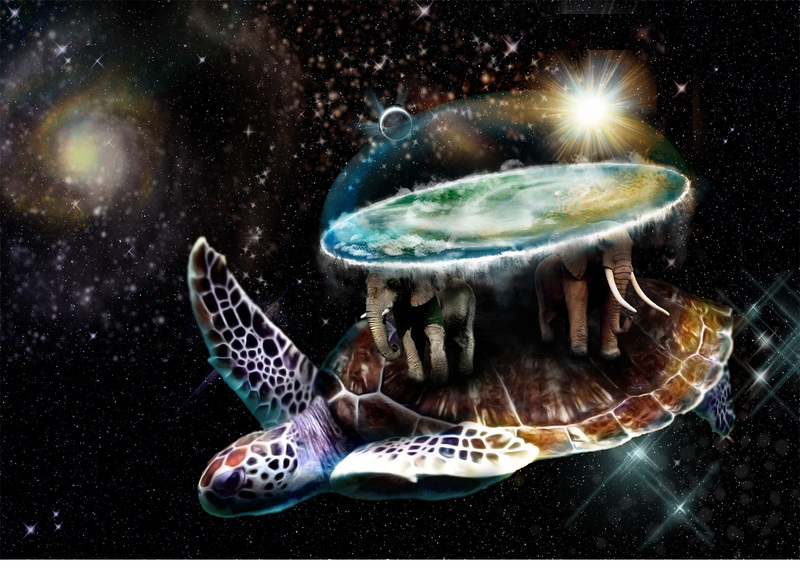 Chronologically, the last official Discworld book I read was Making Money, released in 2007. You can bet I plan on rectifying this soon. The most recent Prachett novel I read was The Wee Free Men, a Young Adult novel that I randomly found while working in a warehouse for Scholastic. At that point I never knew he’d written a YA series of novels that took place in Discworld, let alone that there were three of them (I guess they were always stocked in a YA section rather than with the Discworld books). I absolutely adored the character of Tiffany Aching and felt incredibly vindicated that my favorite author could not only write one of the best YA novels I’ve ever read, but also create one of the very best young heroines. As soon as I finished it I vowed that it would be one of the first real novels I would read to my then-infant, now-toddler daughter when she is a bit older. I also still need to read the rest of them! 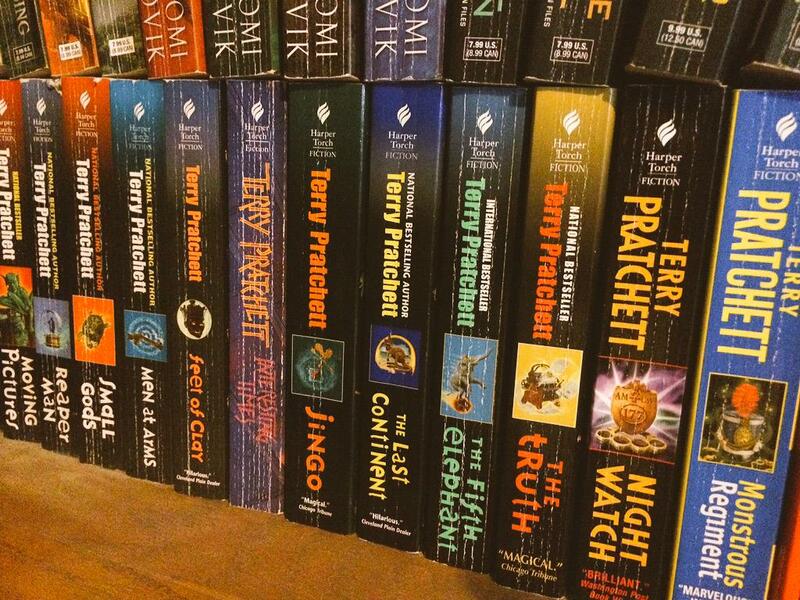 To date I own over twenty Terry Pratchett novels, as well as a gigantic hardcover of The Wit & Wisdom of Discworld. This pride and joy is an elegant collection (compiled by frequent collaborator Stephen Briggs) of over two decades worth of Pratchett-isms, organized by novel. It’s a great reminder of his immensely clever, thoughtful, and always humorous writing. Sir Terry Pratchett was honestly the first author I ever really got into, and possibly the last. I’ve enjoyed and subsequently fallen off of many great authors, but Pratchett’s work was astonishingly consistent and always amazing. His novels were the ultimate comfort food; I can’t recall a single one that I was disappointed with. He will be sorely missed but never forgotten. Thank you for bringing me and countless others so much joy and thoughtfulness over an incredibly prolific career.